This post is dedicated to Sarah Lindahl, who hates the dentist. I had heard that it's really cheap to get your teeth cleaned in Nicaragua. Back home, I never had dental insurance, and so I paid cash for a cleaning once a year, which ran me about $100. So I did. And it was the dentist, not the dental assistant who cleaned my teeth. She looked on and was ready to help me rinse and spit when necessary. Sidebar: I love going to the dentist at home. Love, as in, I get a huge ego trip. "Your teeth are so beautiful", "looks great"...and any time my dentist has had to fill anything he always makes sure to let me know I don't have any cavities, just the start of a cavity, and all he really wants to do is prevent the cavity. I walk out of there with a huge head. It's quite nice. And so...I was kind of disappointed when the Nicaraguan dentist was a little more honest with me. "You have a line crack here", "later in life these teeth here will break. You have secondary molars", "your gums are receding...this is a problem with the white people", "how do you brush?" and the like. And he told me the most shocking news: "You have a cavity." Now this, I was not expecting. I consider myself a citizen of the world (an American citizen of the world, anyway), and I hate that I had any sort of prejudice against dental care in a supposedly third world country. After all, the Nicaraguans have to go to the dentist, right? 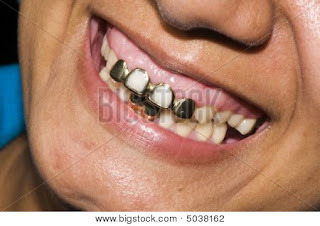 The problem is, a lotta Nicaraguan people have like silver things on every tooth. Little silver squares, like picture frames. Much like the two front teeth of the person in this stock photo. So, my options were to wait until I returned to the States next June, and pay a couple hundred bucks for a filling, and who knows how bad the cavity would be by then...or option two: fill the stupid tooth in Nicaragua. The dentist showed me the drill. "See how small it is?" I was like, I don't CARE! I asked to use the bathroom, and the assistant walked me through an old folks home into what appreared to be the Doctor's personal apartment and his personal bathroom. There was a baguette on a shelf where the clothes were. Like, a loaf of bread. The good news was that the bathroom was very clean. We were joking around about me being nervous and he said, "oh, don't worry, I'm still only a little dizzy from last night." He used some crazy stretchy blue plastic to isolate my tooth along with a clamp that he put on my tooth with an old pair of garage pliers. I was like, "you know this is the stuff of nightmares? Right? Getting your tooth filled in another country?" He looked offended and told me that all dentists use this tool, he got it in Miami. I didn't have the heart to tell him I had never seen one before and quickly backtracked to include ALL dentistry in ALL countries as the stuff of nightmares. Which is kind of true, eh, Sarah? To loosen me up, he said, "I'll tell you a yoke later." When I paid him the $30 (YES YOU HEARD ME. ONLY $30) for the cleaning and filling, he said, "just enough for the party tonight." 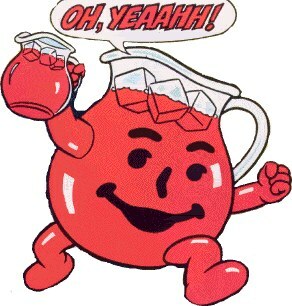 When he was finished filling, he said, obviously pleased with himself: "OH YEAH!" (Just like Kool-Aid man after he breaks through your kitchen wall), and then he said, "I love my yobe!" The last thing I would think of doing on my world tour would be to go to the dentist unless I was in excruciating pain. I can't believe you did that. THAT is the bravest thing you have done this whole year. Braver than riding in cabs that don't look like cabs with strange men, braver than riding sleeper buses in SE Asia. I'm glad you don't have a grill, and I'm so so sorry about the garage pliers. And he's right, all dentists use garage tools. There are sadists in every country in the world. Hey my friend and I went all the way to Puerto Vallarta for her to go to the dentist. Great trip! That dentist sounds awesome. "I love my yobe!" Jajajaja. Incidentally, on a slightly-related note, I liked the ear doctor in Korea much better than the one I went to in the states. He was so cool and friendly, his tech was sweet (he stuck a camera down my ear while I watched on the monitor), and he was dirt cheap. Of course, South Korea ain't quite at the same level as Nicaragua, but it reminded me that the overpriced and soulless U.S. medical system isn't the bomb we Americans tend to think it is. Agreed. It's not SO bad. I am planning to have lots of doctors visits whilst away from the USA, since I have no insurance. Things just cost WAY to much back home! My entire Dengue bill was only $86. Including four visits to a doctor and four times to the lab for blood work, and all my medications. One might conclude that it is actually smarter to have work done in Nicaragua.